A drunken menace picked up a television and dropped it on the ground as police officers looked on in disbelief. John McLaughlan (29) then told them he was going to go to the court and tell them the police had smashed it. Appearing at Falkirk Sheriff Court last Thursday, McLaughlan had pled guilty to behaving in a threatening manner at Garry Place, Grangemouth, on October 24 last year. 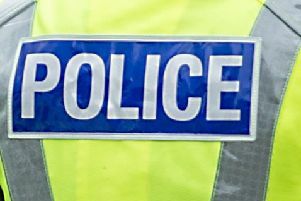 Procurator fiscal depute Katie Cunningham said: “It was 11.42pm and police were contacted in relation to shouting and banging coming from an address. They attended and the accused was hostile towards them. “He was instructed to calm down, but picked up a television which he said belong to him and walked into the common close with it. He said ‘I’ll be saying you did this’ and smashed the television on the staircase causing it to break. McLaughlan’s behaviour turned even more abusive as he continued to shout and swear. When he was placed in the back of the police van he started head butting the cage area of the van, causing a small cut to open on his head. Murray Aitken, defence solicitor, said: “I’m surprised he can recall anything after the amount of alcohol he consumed. He was heavily intoxicated at the time, although that doesn’t excuse his behaviour. Sheriff Derek Livingston said McLaughlan’s behaviour was “appalling” and it had been his second altercation involving police officers. McLaughlan, 21 Graham Terrace, Airth, was placed on a supervised community payback order for 18 months and told to complete 150 hours unpaid work within six months.